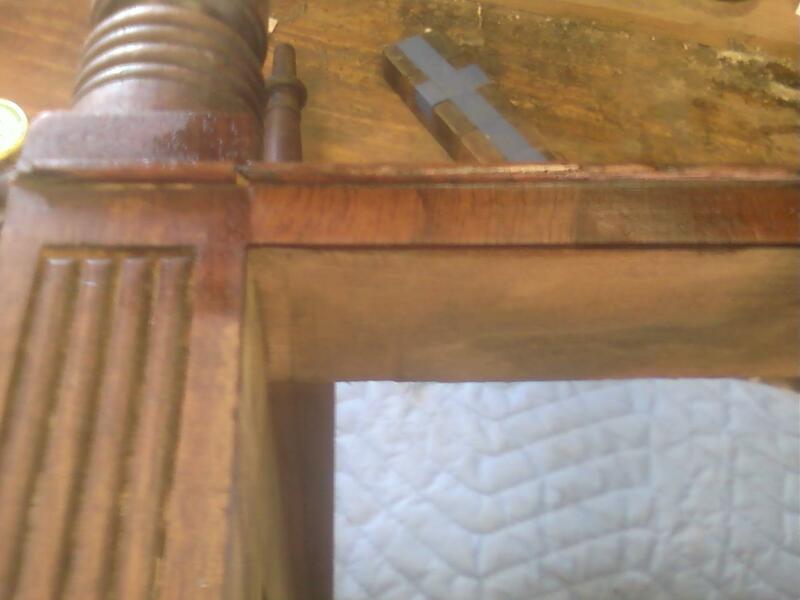 The writing surface had become loose at one of the joints. 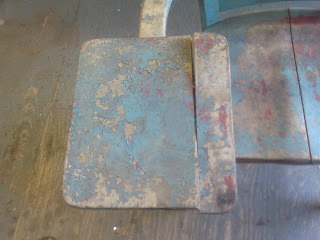 The seat had also become unglued. Here is a photo of the chair dismantled. 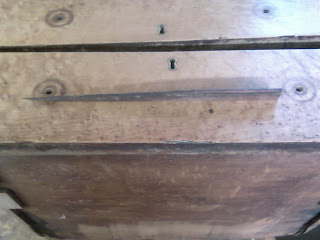 the back was loose as well, but the rails were nailed to the legs and to try to dig them out would cause more damage than necessary. 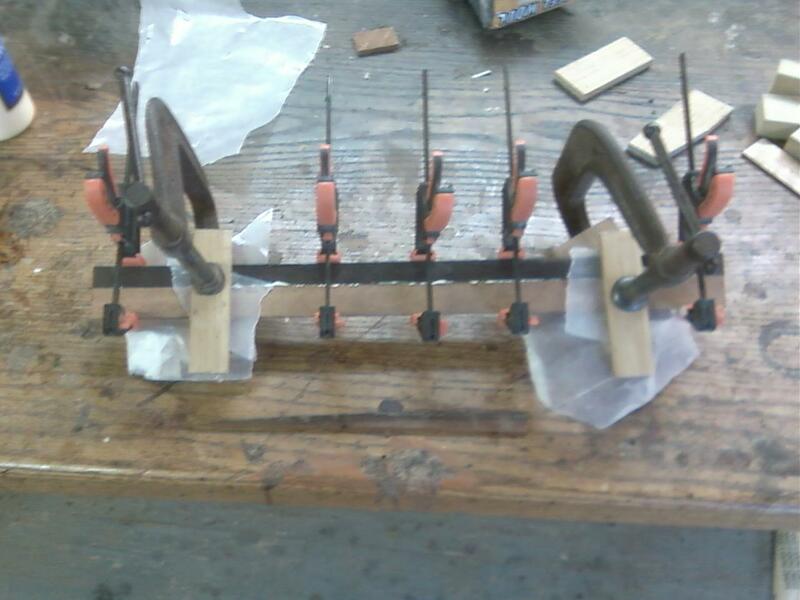 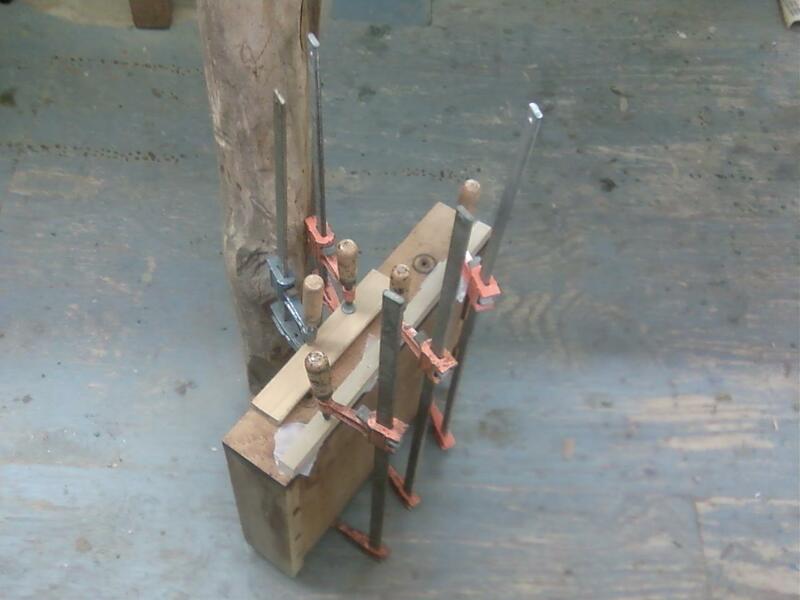 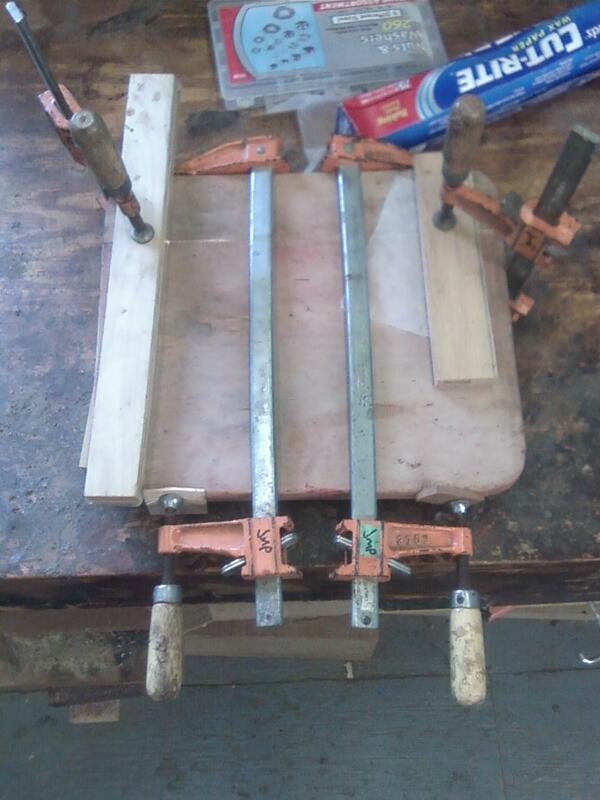 Instead I later shot glue into the joints using a syringe and clamped the back. 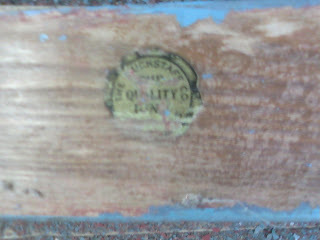 While removing the paint I luckily unearthed this label which was partially missing. By studying it I decided it said "The Buckstaff Co.- The Quality Line- Oshkosh, Wisconsin" The location I got from the website. 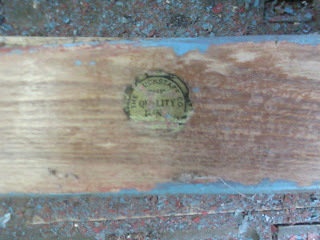 Here is a close up of the label. 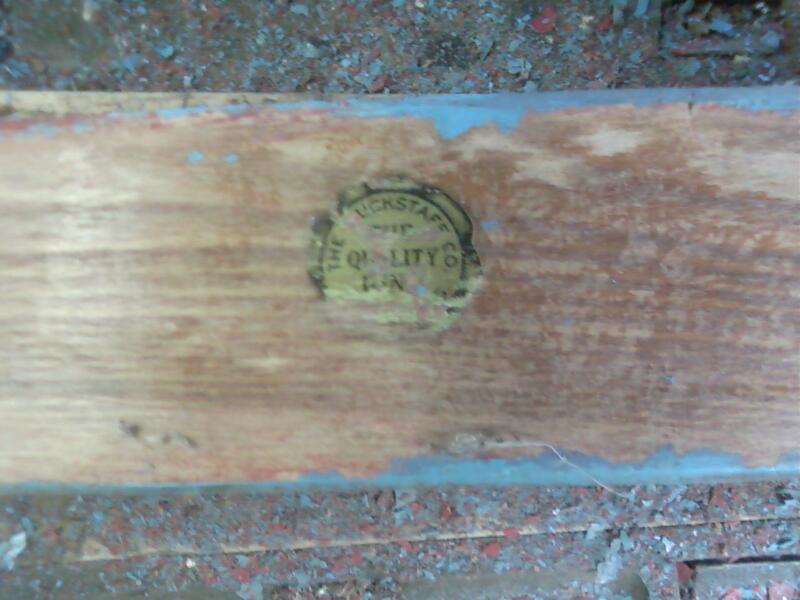 I was able to save the label. After removing the paint the next thing to do was the repair work. The photo below shows the writing surface getting glued. 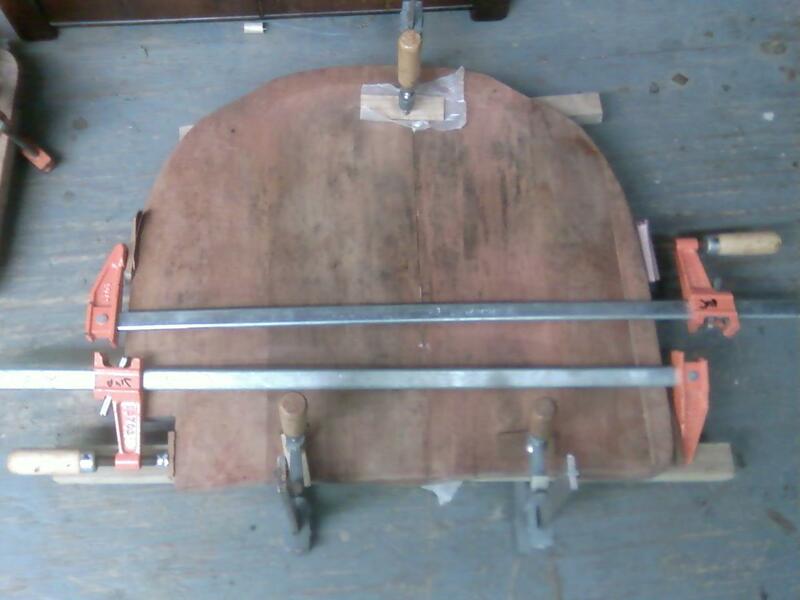 Here is the seat getting glued up. The frame for the seat was screwed to the back legs and the screws had rusted into the legs. When I tried to remove them, three of the screws broke in place. 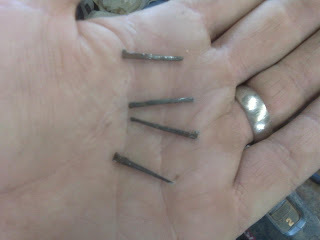 The result was that I had to dig them out creating holes to large for the screws. 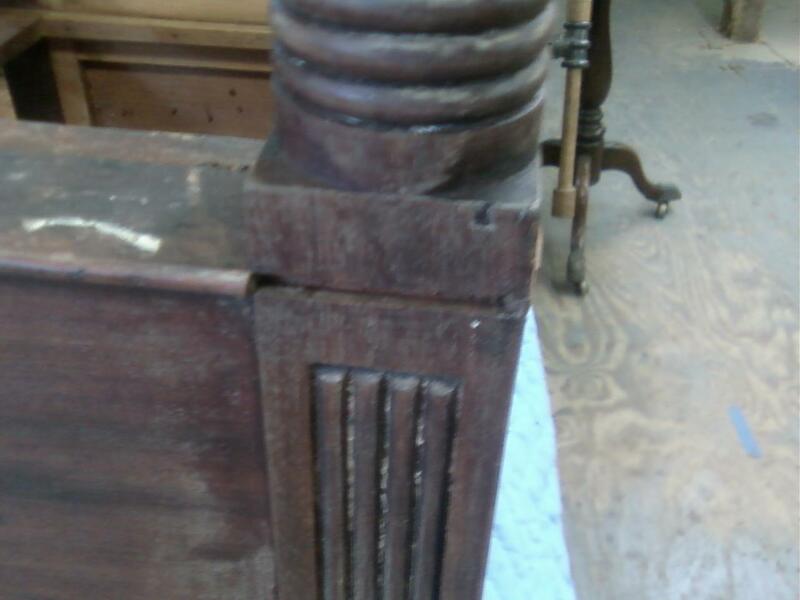 Below is a photo of the damage. 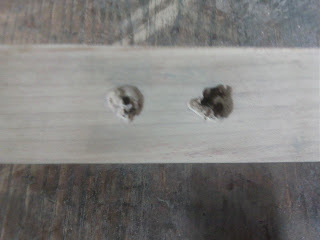 The remedy was to drill the wholes out using a Forstner bit and plug them with maple plugs. 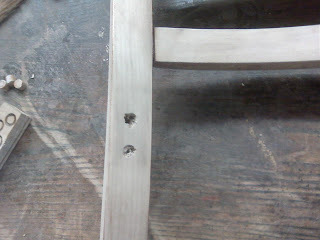 after the plugs were glued in place the holes would be re-drilled to accommodate the new screws. 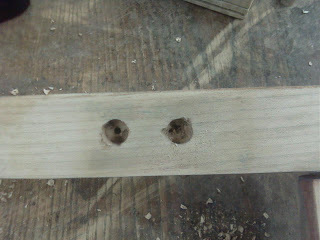 below is a photo of the holes after they were drilled out. 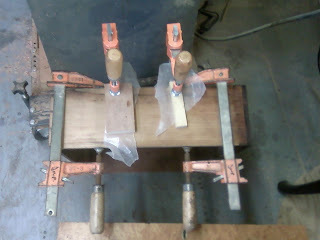 The Maple plugs put in place. The excess of the plugs was trimmed flush. 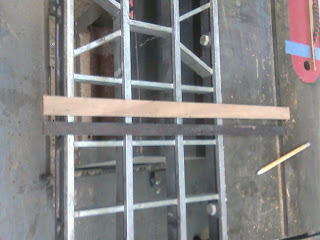 this repair will not be seen, but will give strong support. 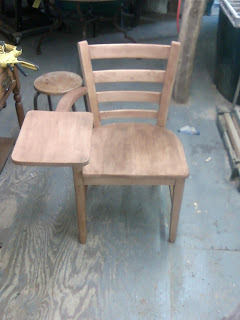 Here is a photo of the chair sanded and ready for gluing. 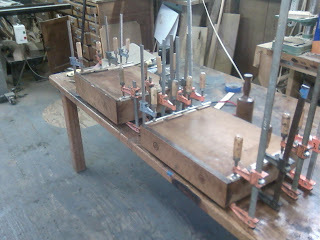 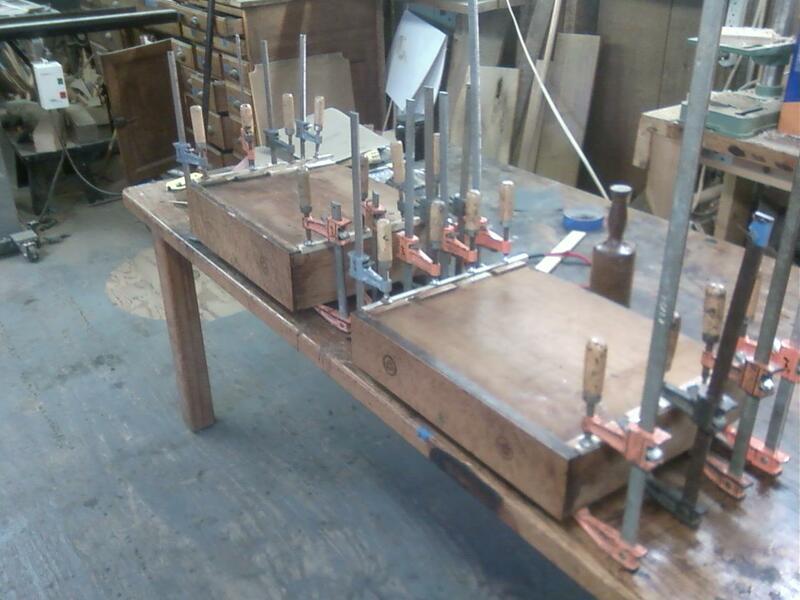 The chair being glued up. 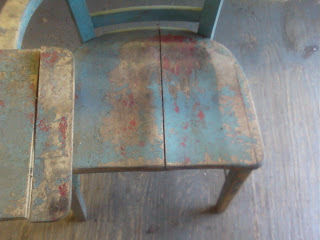 I lightly stained the chair to help eliminate any color left from the paint. Once the finish is applied the chair will have an oxidized maple look. 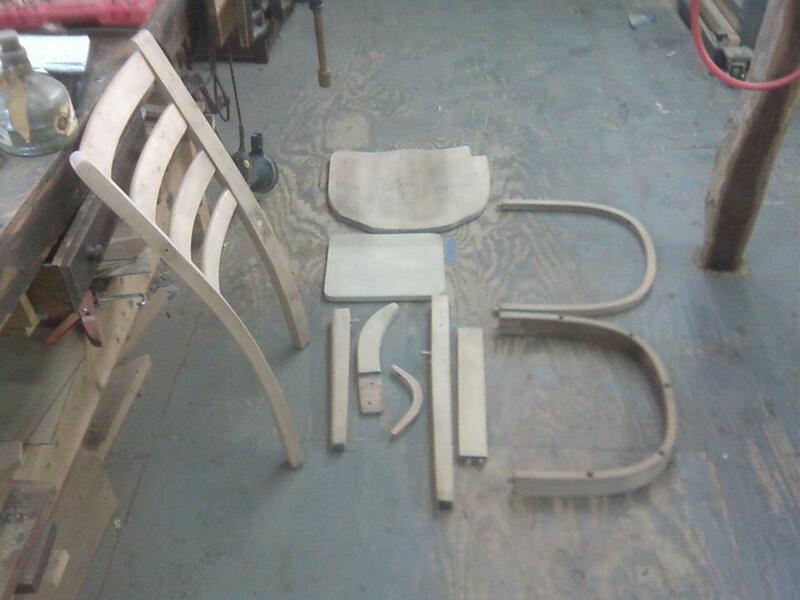 I will post photos of the completed chair when I finish. 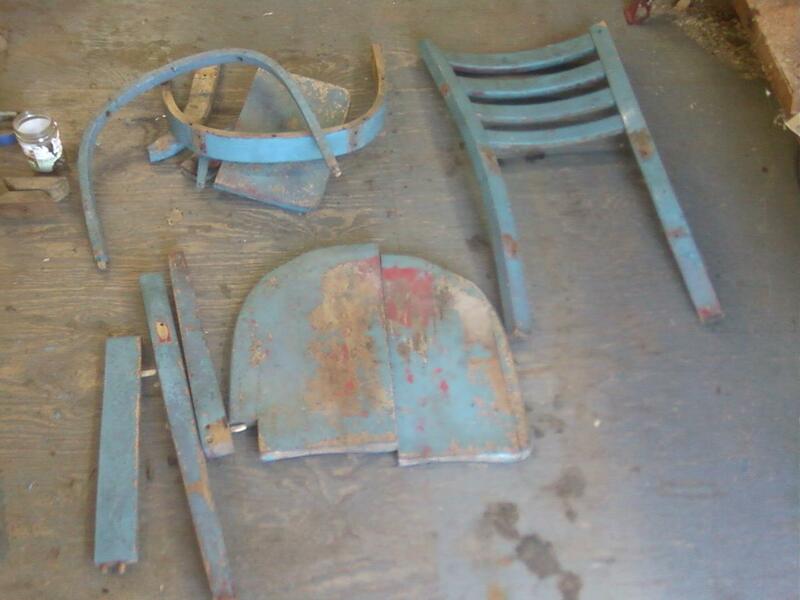 The Chair pictured above is for Sale. 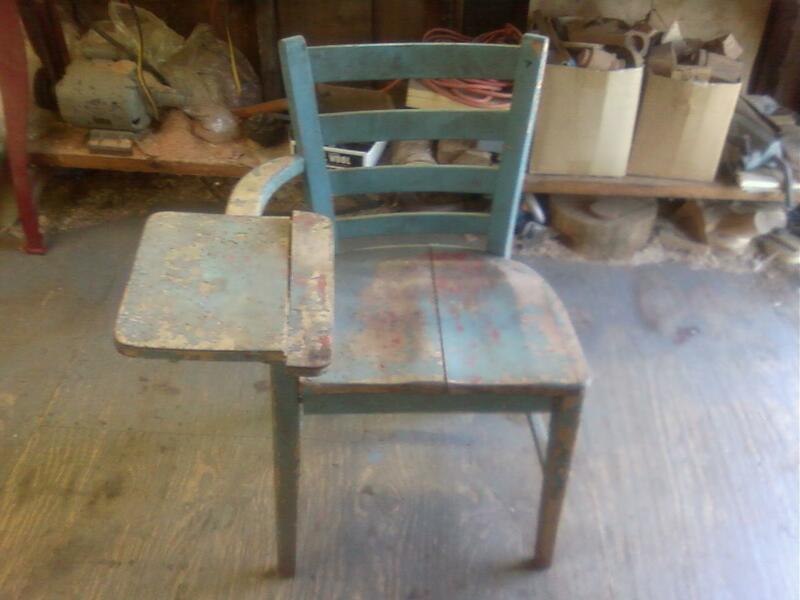 It is a Morris Chair made around 1900. 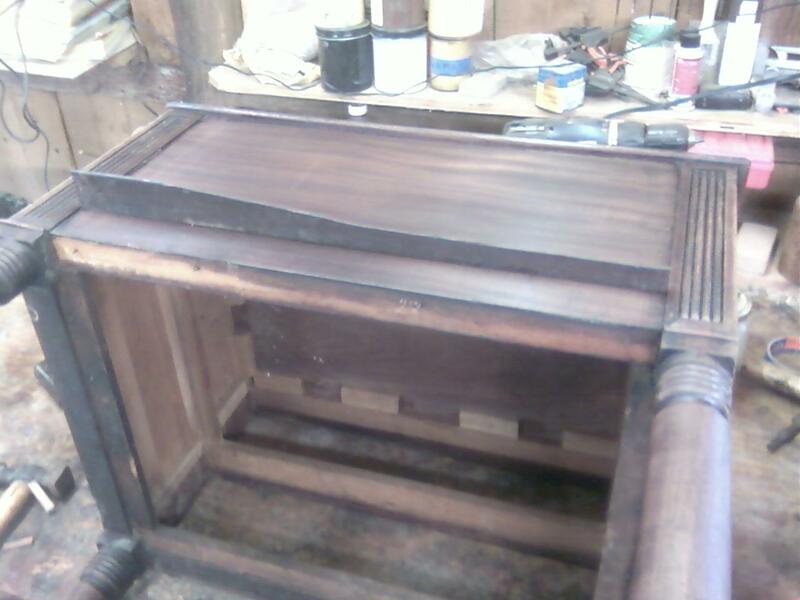 The Frame is made entirely of Quartersawn Oak and has Characteristic Turned Balusters supporting the arms and carving on the front legs and the front apron. 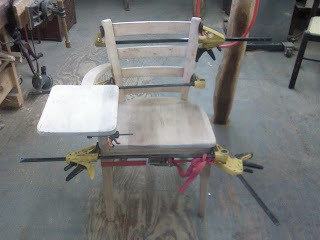 The back of the chair reclines to several positions. The chair is in good shape overall. The finish is restorable but could use some work and the seat and back cushion need reupholstering. 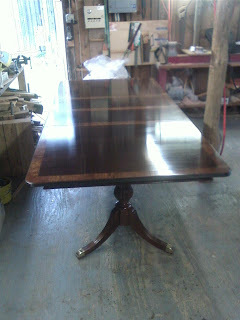 You can click on the image to view it in a larger dimension. 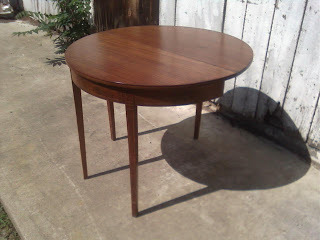 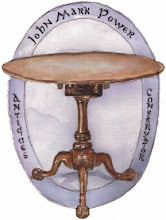 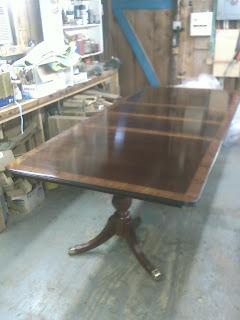 If you are interested in purchasing this table please contact me at (703) 727-5691 0r at info@johnmarkpower.com. This photo is a close up of the drawer fronts. 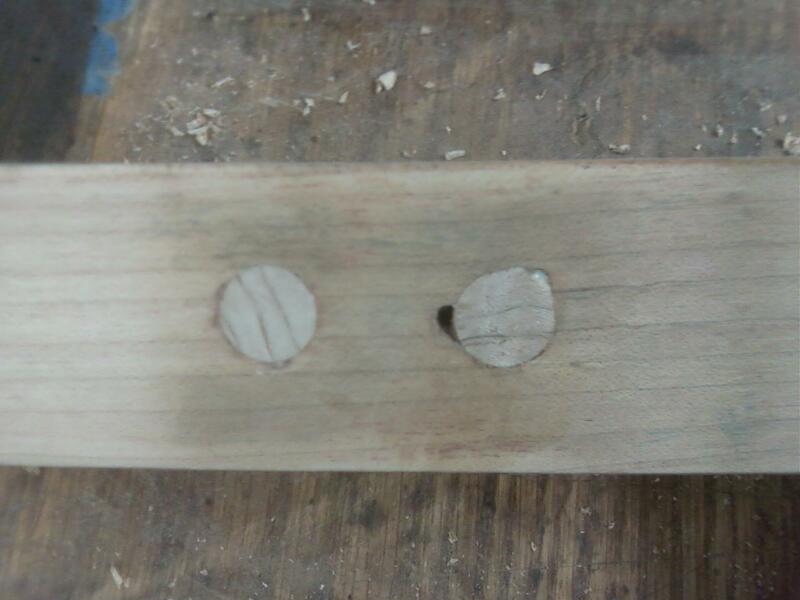 The new pulls will also have back plates that will cover up the rings left by the old pulls on the wood. One of the rings can be seen on the lower left hand side where the pull is missing. 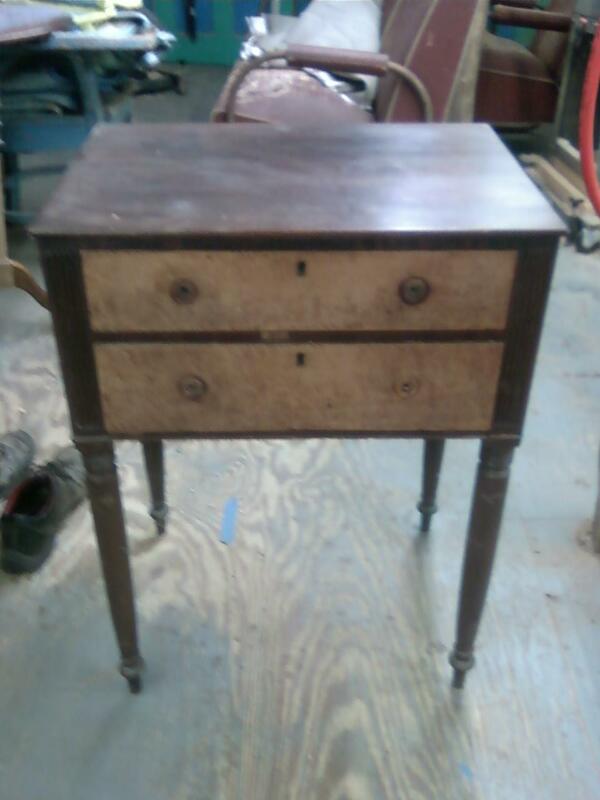 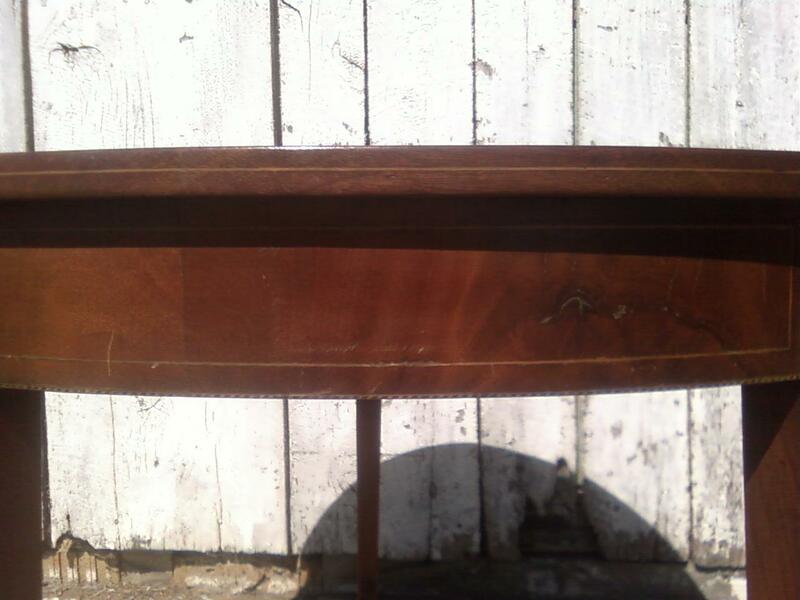 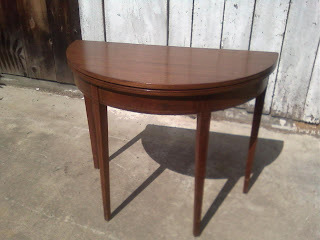 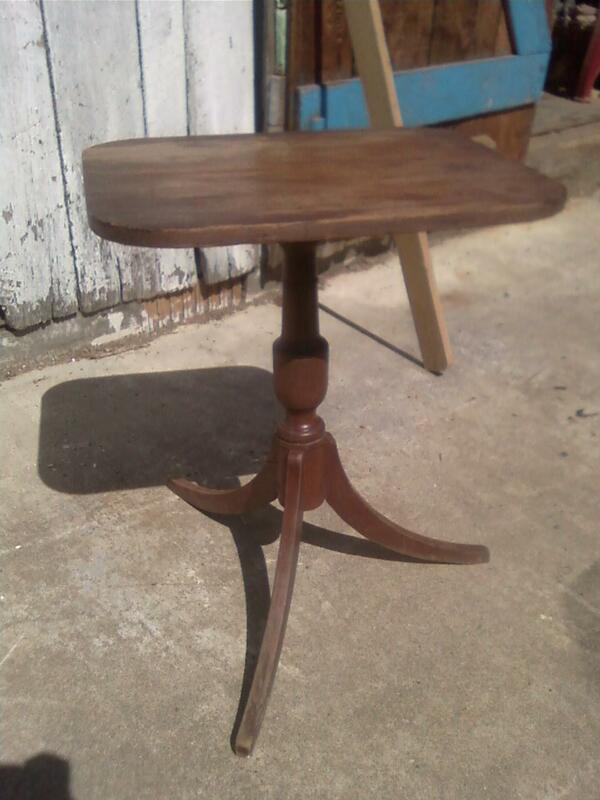 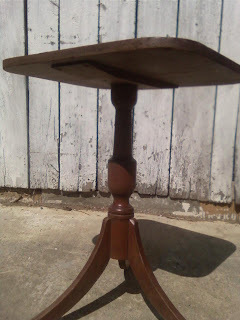 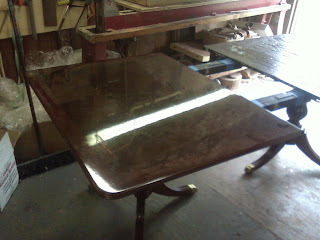 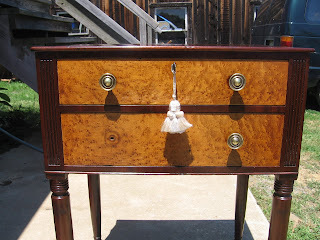 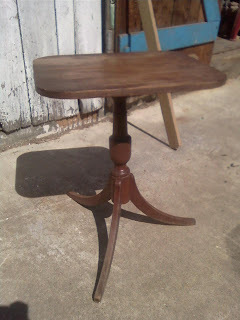 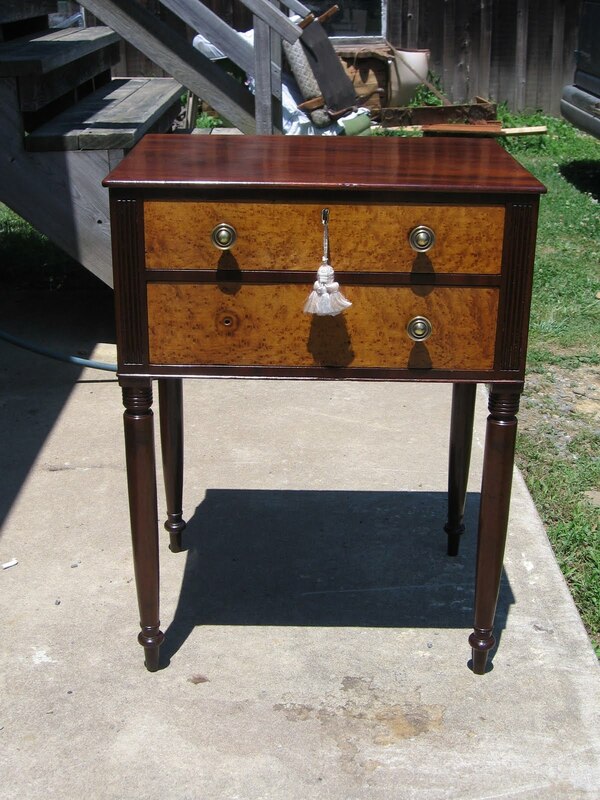 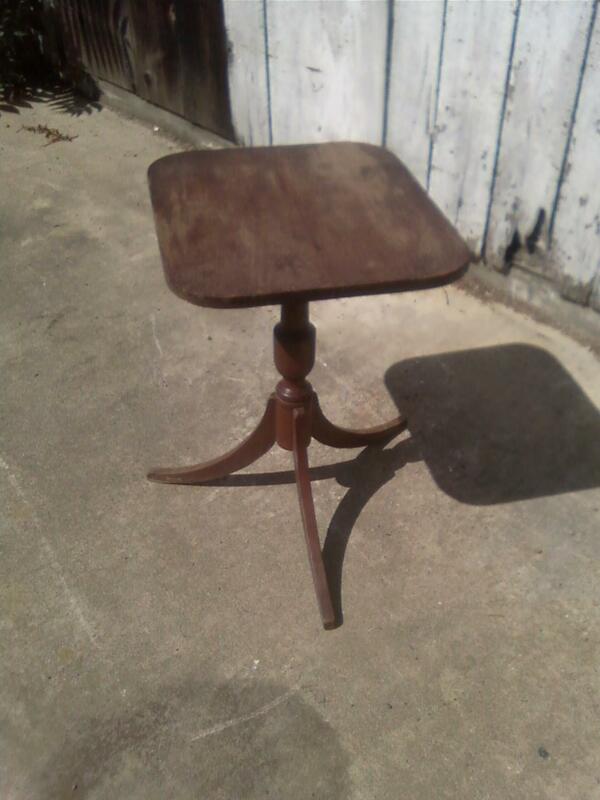 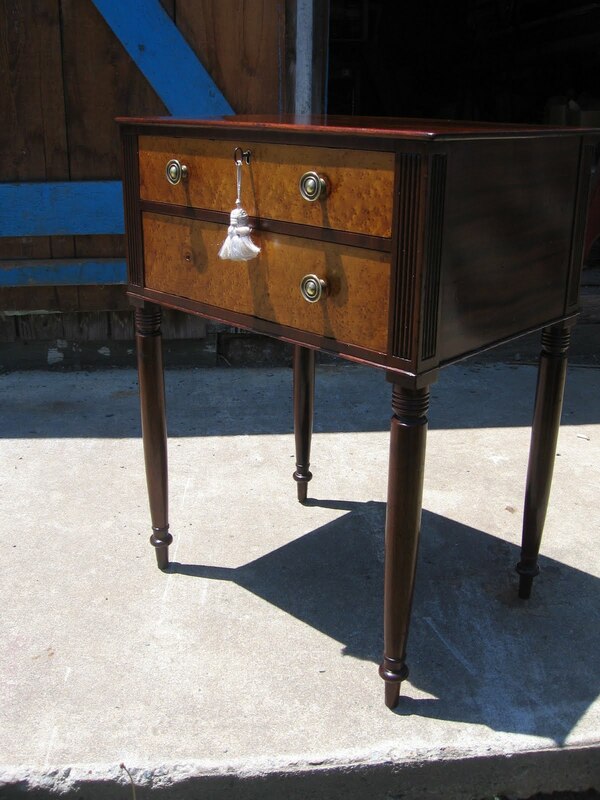 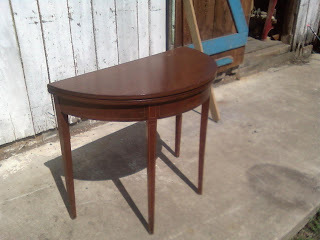 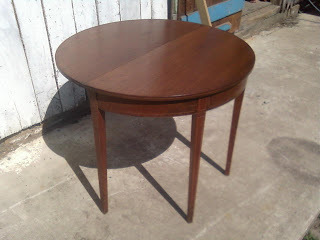 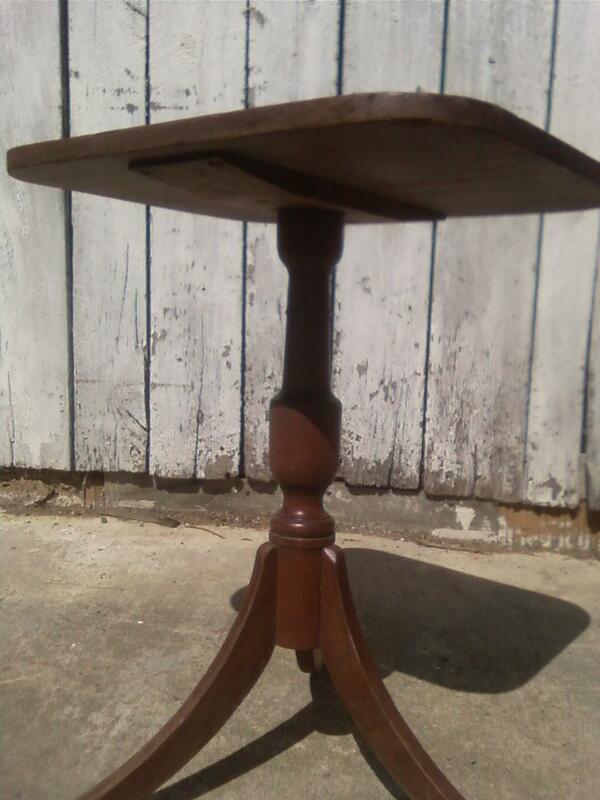 One of the pieces I have been working on recently is a Work or Sewing Table from the Federal Period. 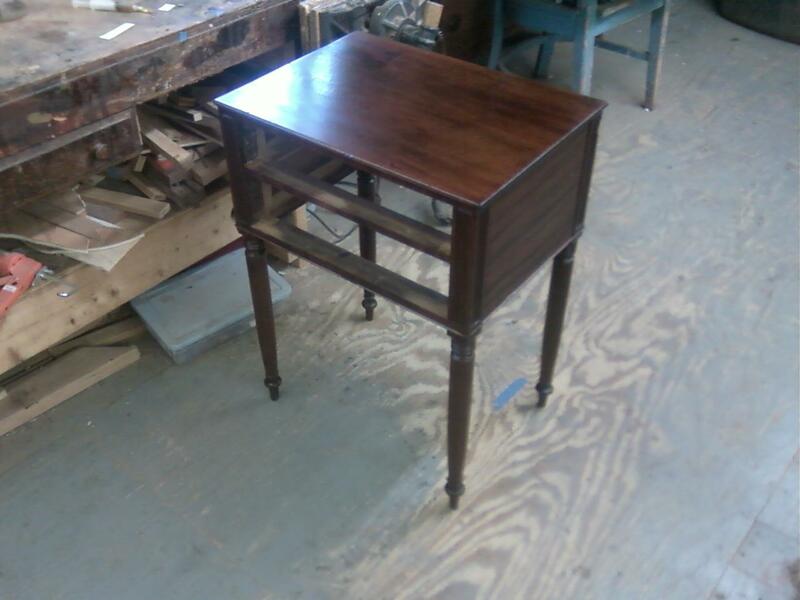 This table is also called a two-drawer stand.The Federal Period in antiques refers to furniture built in the United States between the years 1785 and 1810. 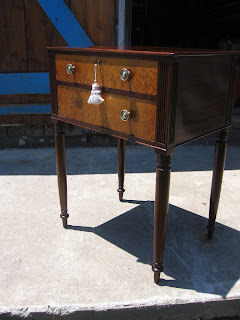 The inspiration for this style came from the drawing books of George Hepplewhite and Thomas Sheraton and usually the American forms of these styles showed refinement and simplicity in design. 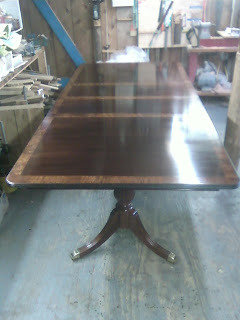 There was a strong use of inlay and veneer work and contrasting primary woods. The work table is no exception. The case and legs for the table are made from Cuban Mahogany and the drawer fronts are veneers of Birds Eye Maple.The Birds Eye Maple was used in place of Satin Wood , which was used often in Europe as a contrasting wood with Mahogany. 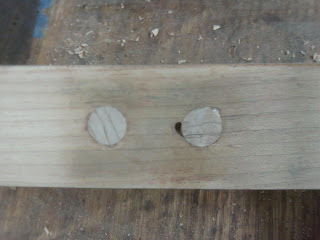 The use of Poplar as a secondary wood points towards it being a made in the south perhaps as far north as Philadelphia or Baltimore. 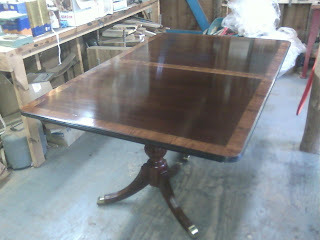 Overall, I would put the age of the table around 1800. 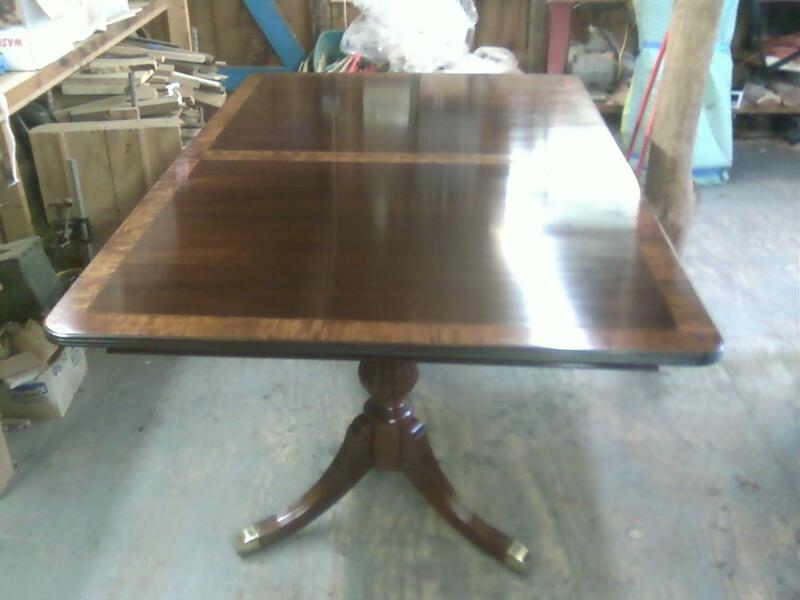 It has a lot of features associated with the designs of Thomas Sheraton. 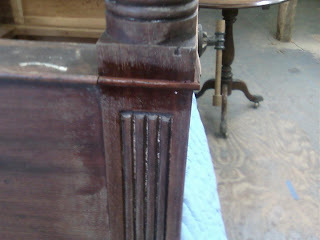 Including the fluted legs above the turnings. 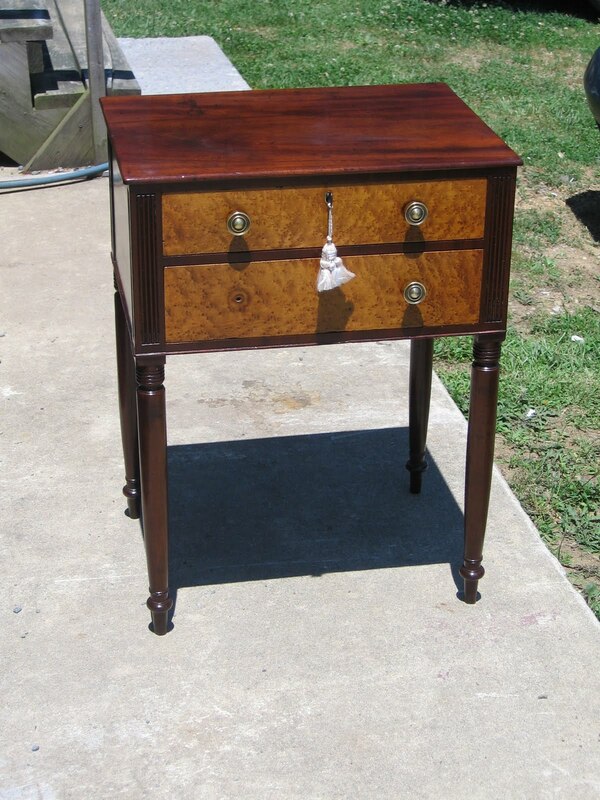 It is a lovely piece with well defined turnings and crisp carving built during the infancy of the United States. 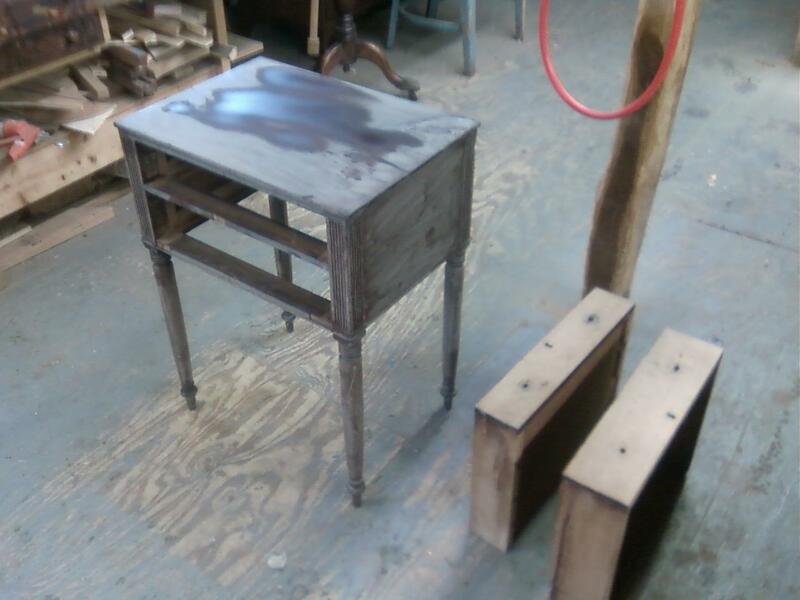 The work table as it came to me. 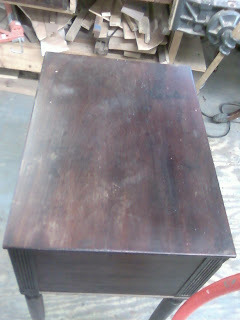 The condition of the finish on the top. 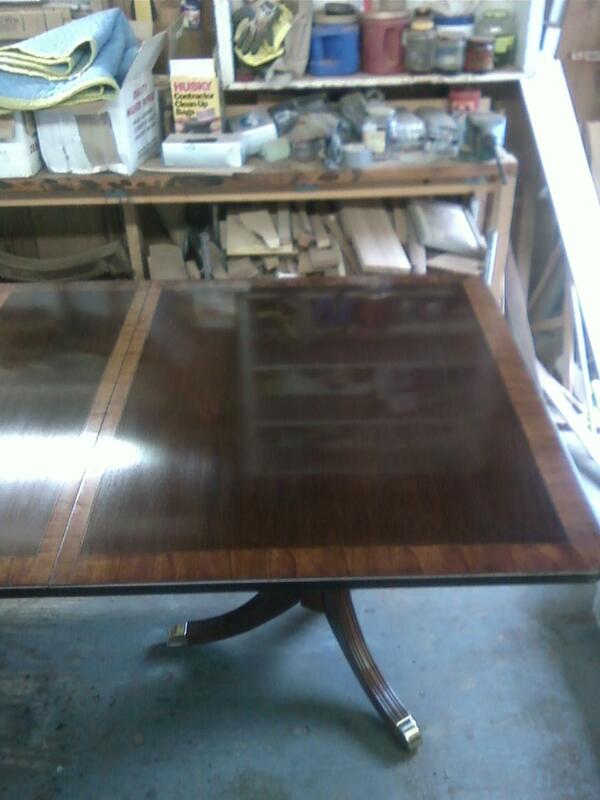 This picture shows the finish being cleaned with mineral spirits. Resting on the side of the piece is a section of cockbeading removed from the underside. the section is broken off along the upper right hand edge. 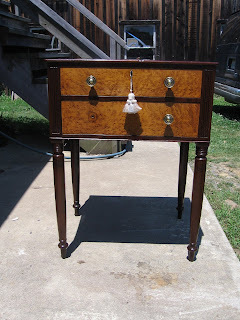 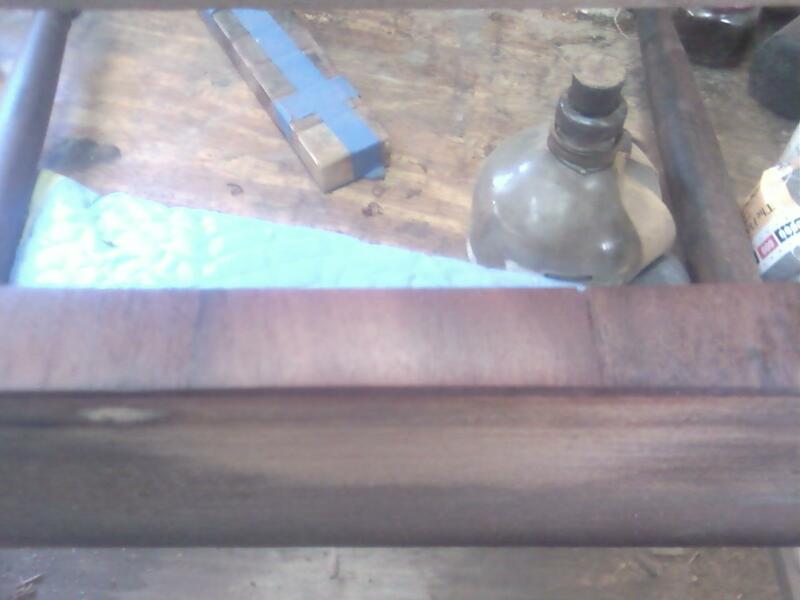 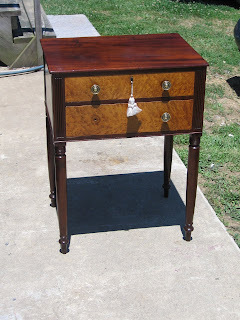 To repair this, I decided to use the original cockbeading by ripping the damaged section and then adding new mahogany on the side which will face in, so that the oxidation of the old wood is the only part that will show. 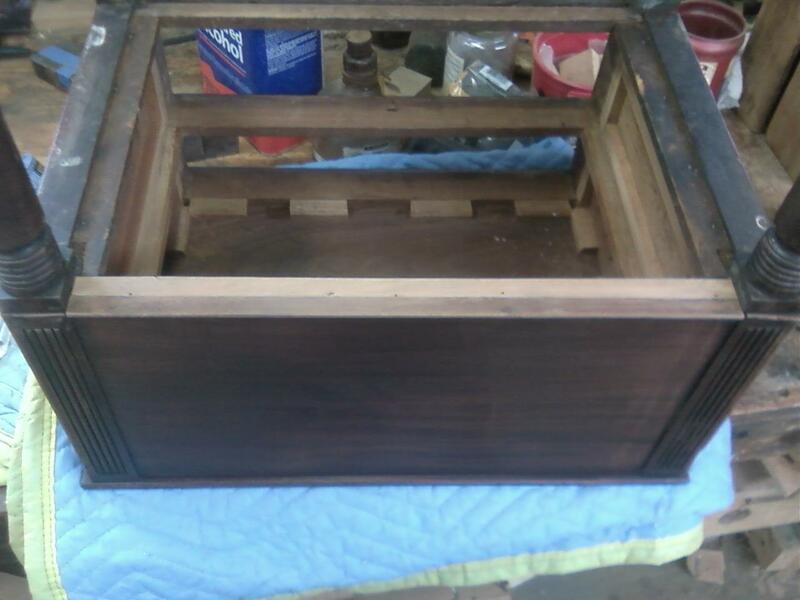 the pictures below show the process. 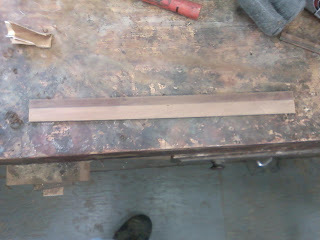 This photo shows the old below the new strip that will be added. 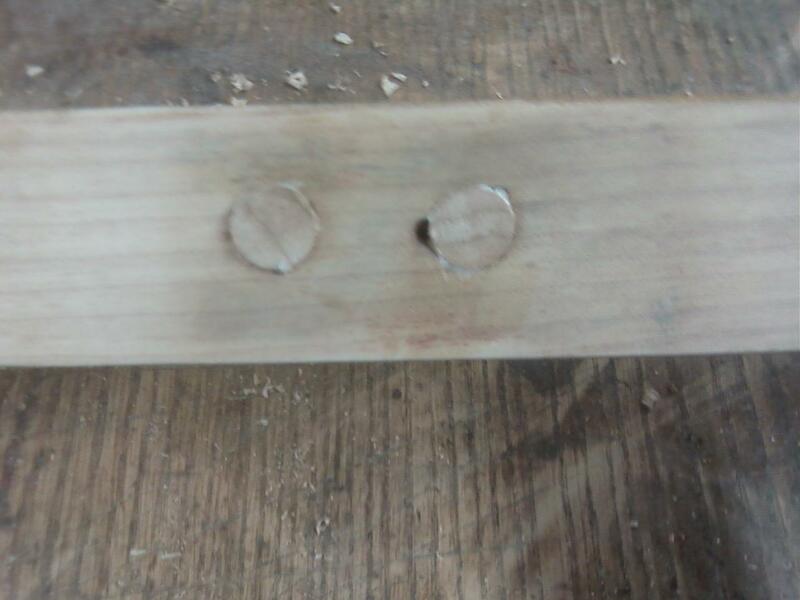 I created the cockbead profile on the old wood seen here from the end grain. The beading was attached with hide glue and old cut nails. 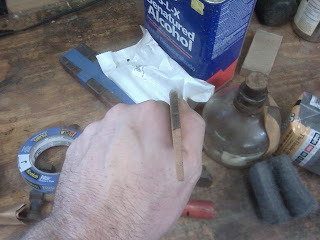 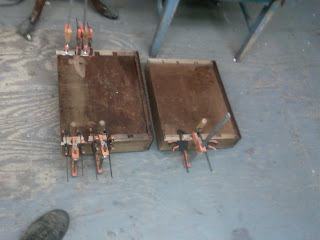 I was able to salvage the old nails pictured here and reattach it using he same nails and new hide glue. The repaired beading in place with the new wood on the inside. 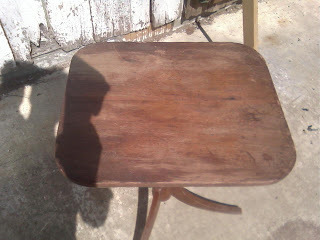 It will be darkened later in the process. 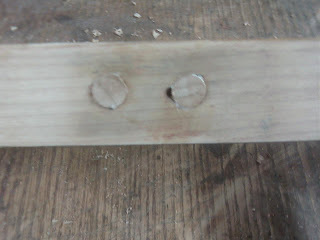 The remaining section of the broken beading which I had ripped off is pictured below resting on a drawer front. 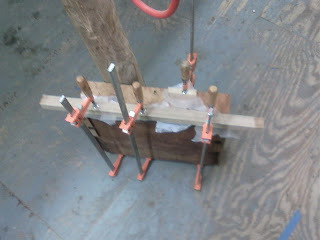 I used his piece to patch two missing sections of beading around the legs. Here is a photo of the space in the leg where the new cockbeading will go. The new beading made from the old wood. The new beading being glued in place with hide glue. 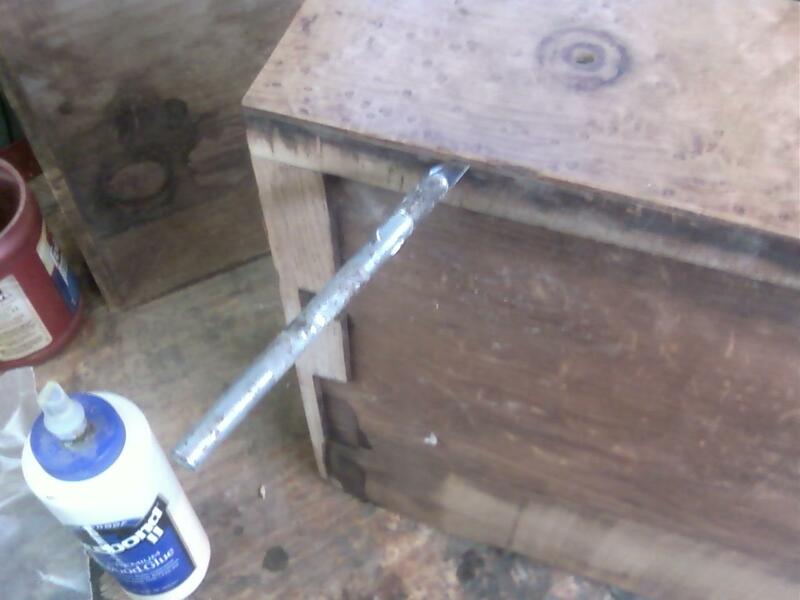 Once the glue had set the excess is wiped off with warm water. 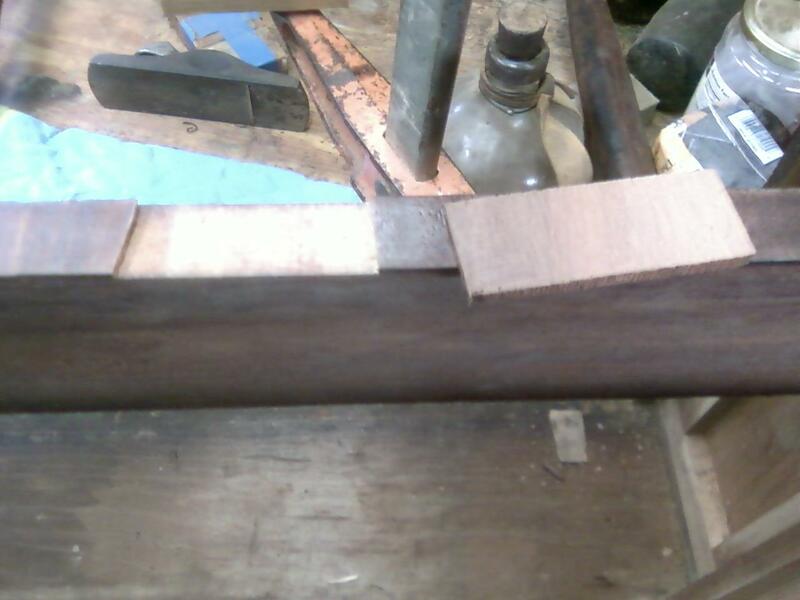 Here is a missing section of veneered from the drawer dividers. a patch set next to a missing area on the divider. 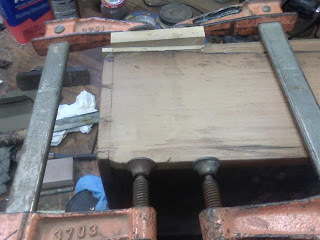 Gluing the patches in place. 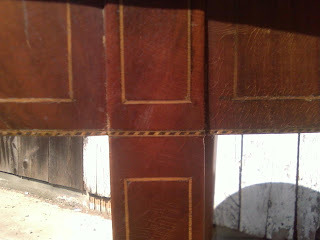 One of the patches after sanding. The above photo shows the veneer on the drawer fronts loose along the edges, the X-acto blade is seen between the veneer and the secondary wood. 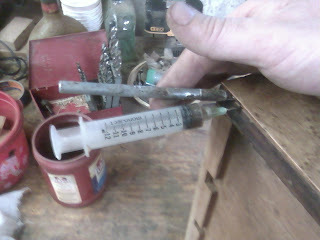 The photo below shows hide glue being injected with a syringe under the veneer. the next two photos show the veneer being glued down. 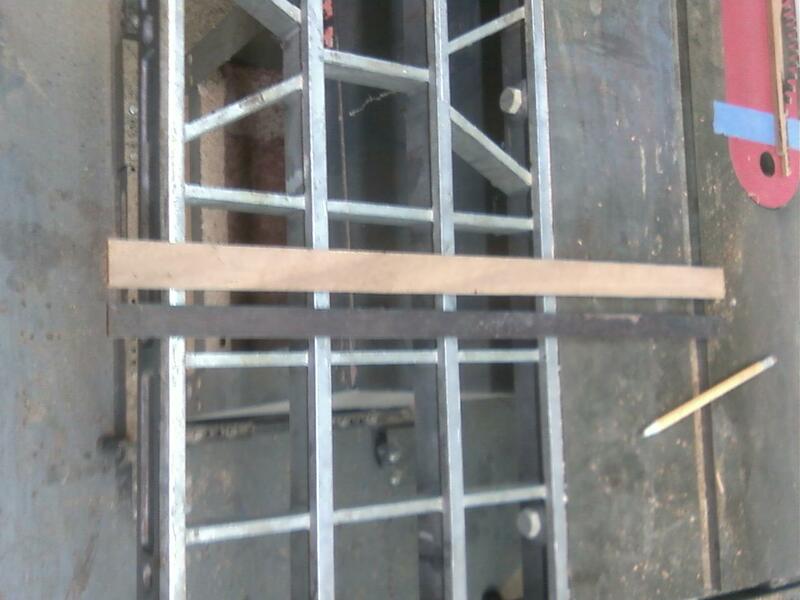 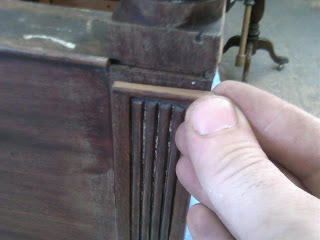 This photo shows one of the drawer sides being repaired. 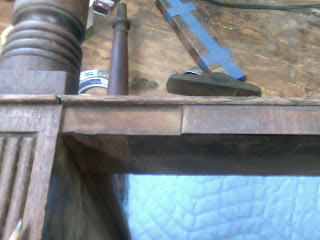 Below is a photo of a patch in the drawer runner being glued in place. this photo shows missing blocking being glued to the drawer bottoms. 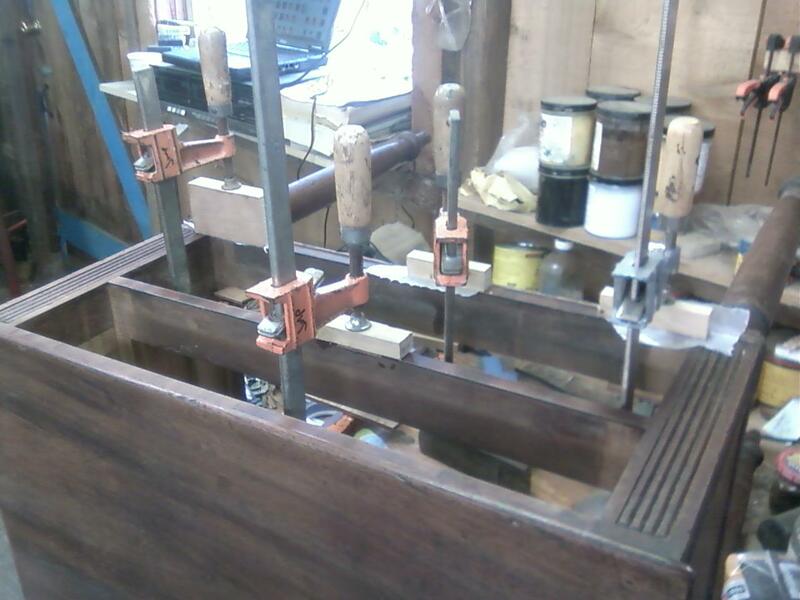 Here is a photo of new runner material being added to the bottoms of the drawers. The last photo shows the case with a few coats of French Polish on it.